Happy Relatively New Year! 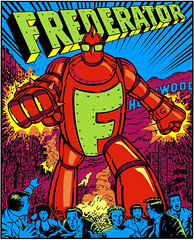 Hopefully, 2004 will bring you many breathtaking and awe-inspiring moments, not the least of which could be the occasional receipt of our Frederator Studios eLetter, bringing you the latest and greatest in Frederator news on a schedule that can best be termed sporadic and patchy. Or spotty. So, here’s what’s new with us. Frederator Show Nabs Most Annie Noms We’re celebrating in Burbank as word is in that My Life as a Teenage Robot is up for five (5!) Annie Awards, more than for any other TV show. Better still, our studio has grabbed a total of nine nominations for this year’s awards (the animation industry’s Oscars). You can find Frederator nods at the end of this email, and the complete list of nominees is at ASIFA Hollywood’s site. The big ceremony is on Saturday, February 7. Frederator Plows Ahead With Tons Of New Programming. The Annies are the perfect way to kick off 2004. And the perfect way to cap 2003 was Nickelodeon’s December order of more than twenty-six hours of Frederator programming. So, sincere congratulations to all the talented men and women who make these cartoons so wonderful. Now get to work. Nick’s press release on the new show order is here. Item! Fan fiction continues to fill up a large chunk of the Teenage Robot message board (itself at more than 550 topics) on Nick.com. While fan fiction – or ‘fan-fic’ for those linguistically savvy (or those just in a rush) – remains a favorite of fans who enjoy the opportunity to show off their story-telling chops, the board’s most popular topic remains the question whether Jenny looks better as a red or green robot. Questions, comments, complaints? Or you just don’t want our Frederator updates? Let us know at hype@frederator.kz. I really love Fairly Odd Parents.